A preview of Gameday Audio in MLB.com At Bat 2009. As a baseball fan, I’m not sure how I missed this. (Perhaps it was the typical mid-winter doldrums.) 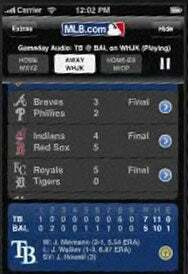 Following up last year’s $5 MLB At-Bat app for the iPhone, Major League Baseball has released a new free version of its live scoreboard app just in time for spring training and the World Baseball Classic. And there’s promise for much more by the time the regular season arrives. Available now, MLB.com At Bat Lite is a free app that will provide live baseball scores all year long, as well as real-time play-by-play for select pre-season and WBC games during March. That’s nice and all, but the bigger news is that the forthcoming MLB.com At Bat 2009 app will include not just live in-game video highlights and the MLB gameday feature added late last season, but support for Gameday Audio. That means you’ll be able to use the app to tune in the radio broadcast of any game, with home or away announcers, including the broadcast from your local teams. It's unclear what the full MLB.com At Bat 2009 app will cost — for what it's worth, MLB.com charges $15 for a season of GameDay audio streamed to a Mac or PC. For more information, Major League Baseball has posted a promotional video of At Bat 2009. The video says the full app will be available on April 2—just in time for the regular season, which begins Sunday, April 5.